The artwork from classic Disney Attraction Posters has made it's way onto 4 new limited time T-Shirts. If you are like us, you can never get enough of those great posters. Turning them into wearable art is a great idea, but unfortunately your chance to get your hands on one is very brief. 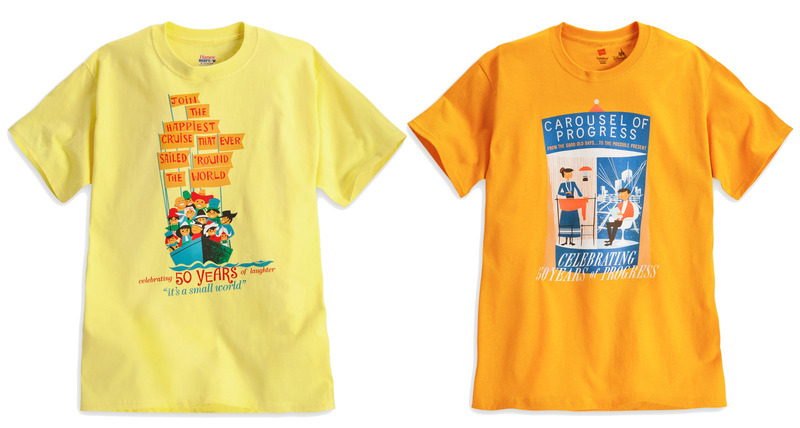 This year, we’ve been featuring a series of Disney Parks’ attraction poster T-shirts on our Disney Parks online store. These shirts are sold for a limited period of time, and feature some pretty amazing art of things I love at Disney Parks! Today, I’m happy to share details about four new T-shirts coming to the online shop in April. Once again, Disney Design Group Artist Richard Terpstra was inspired by posters featured in the outstanding “Poster Art of the Disney Parks” book by Vanessa Hunt and Danny Handke (a must have book for any Disney fan!). 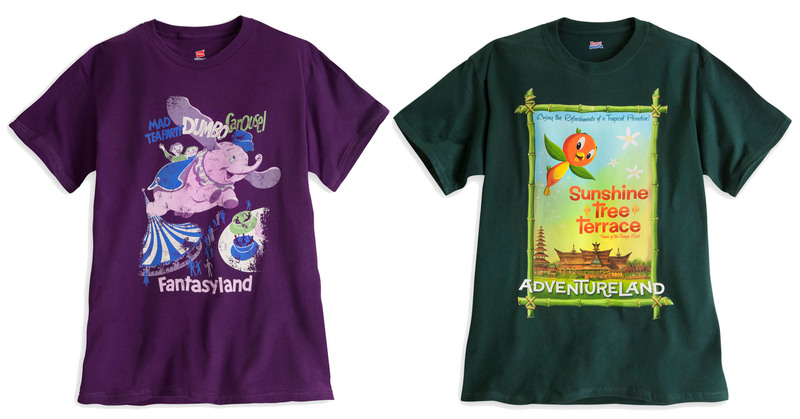 From April 15-20, the Disney Parks online store will release two T-shirts – a purple shirt celebrating Fantasyland at Disneyland park, and a green shirt featuring the Sunshine Tree Terrace at Magic Kingdom Park. The original Fantasyland attraction poster referenced for the purple tee was created in 1955 by Bjorn Aronson. For the green t-shirt, many readers may recall seeing this attraction poster when the Orange Bird returned to the Sunshine Tree Terrace in April 2012. I can’t wait to wear mine while enjoying a citrus swirl in Adventureland (does anyone care to join me?). Then, from April 22-27, we salute the 50th anniversary of two classic Disney attractions – “it’s a small world” and Walt Disney’s Carousel of Progress. Both attractions debuted at the 1964 New York World’s Fair and later found their way to Disney Parks. For these T-shrts, we will offer both adult and kids sizes. The “it’s a small world” shirt was inspired by the attraction poster designed by Paul Hartley in 1966. The Carousel of Progress shirt references a design from 1967 by Ken Chapman (I want to be that guy pictured at right living in Progress City!). To find these T-shirts, I invite you to visit http://www.DisneyStore.com/ParkEvents during the dates referenced above. The shirts will ship in 6-8 weeks once orders are completed (express shipping is not available). 0 comments to "Disney Attraction Poster Art Is Featured On 4 New T-Shirts"